It’s Friday morning and, as I walk to the market, I am hit by the familiar smell of roast chicken and fresh challah. I am in the parking garage of the Jewish Community Center (JCC) of Hong Kong, China, walking towards their tiny kosher market, and it smells like Shabbat. 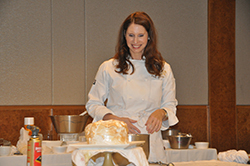 Chef Paula Shoyer displays her finished coconut cake. When I started my pastry journey back in 1996 in France, I aspired to learn to bake great desserts to serve for Shabbat and holidays. I have since discovered that when you go down a path in life, if you keep you eyes open, you never know where you will end up. My trail led to Hong Kong where, in the fall of 2013, I taught a class on elegant pareve (no dairy) desserts to the Jewish community. There has been a Jewish presence in Hong Kong since 1842 when Hong Kong became a British colony. At the time, two prominent Sephardi families moved their businesses to Hong Kong and encouraged others to join them. The beautiful Ohel Leah Synagogue was built in 1901. Ashkenazi Jews came from Eastern Europe in the 1890s and after WWII. There was a continuous, active community until WWII when members either left or were interred by the Japanese. Another wave arrived as refugees after WWII. The current JCC complex, built in 1995, is adjacent to the synagogue. It houses a restaurant, swimming pool, library, preschool, event spaces and offices. There has been a Jewish day school in Hong Kong since 1991, once headed by former Charles E. Smith Jewish Day School head of school, Jonathan Cannon. In addition to Ohel Leah, Chabad has a strong presence in Hong Kong with daily minyans serving breakfast and a delicious Kiddush lunch on Shabbat open to visitors. I stayed with Chabad Rabbi Avtzon and his wife, Goldie, the sister of DC Lubavitch Rabbi Levi Shemtov. My appearance was co-hosted by the JCC and Chabad. The current Jewish community is diverse. Women at my event hailed from the UK, Australia, South Africa, France, Brazil, Belgium, Israel, the US and Asia. My appearance came about after DC natives David and Sarah Feith were sent to Hong Kong for David to serve as Wall Street Journal’s Asian correspondent. At their first Shabbat dinner there, they were served the carrot cake from my first book, The Kosher Baker. I had several days to explore the city. Sarah took me to the antique shops of Hollywood Road where I enjoyed fragrant jasmine tea. We visited the ladies’, flower, bird and night markets. We found stores on Kowloon’s Shanghai Street that only sell cooking and baking equipment. On Shabbat afternoon I huffed and puffed my way up to Victoria Peak and enjoyed sweeping views of the city. Sunday was spent going to Lantau Island to see a giant Buddha and then back in Hong Kong to Stanley market to buy gifts. I also got a foot massage. While there, I ate three times at the kosher Sabra restaurant at the JCC, which features an international menu. I sampled the tiki masala chicken, spring rolls, tandoori chicken salad with mint cream dressing and then perfectly crisp roasted salmon with sautéed bok choy. The food was delicious. The last day of my trip was spent prepping for the baking workshop. My helper Tony is the head baker in the community, and his team of Chinese chefs bakes challah and bread for the kosher store. They also supply desserts to the restaurant and other community events. The baking workshop menu was: Chewy Chocolate and Olive Oil Cookies and Babka Bites from The Holiday Kosher Baker with the Fruit Galette tart and Coconut Cake with Lime Filling from The Kosher Baker. Every person made a mini tart to bring home. I definitely had to do some improvising with different ingredients and yet all the desserts came out great. Tony baked the coconut cakes and prepared the babka dough. To make the lime curd, he brought me limes that were maybe 1-inch little balls that required zesting and juicing. All I had was your grandma’s box grater; yet my fingers survived. For juicing I used a contraption that I had to be told was a juicer. There were other challenges. We didn’t have enough plums and berries for the tarts so we used gooseberries and star fruit, which I did not know you could even bake. What a nice burst of tartness in the tarts! The kitchen had no hand mixer to beat the 7-Minute Icing over a double boiler, so Tony devised a plan: I heated the ingredients over the double boiler and transferred them to the bowl of a stand mixer. He placed another bowl under the mixer bowl and poured in boiling water. We turned on the machine and 6 to 8 minutes later, we had thick, marshmallow-like icing. A final challenge was the extremely powerful blowtorch which lit the icing on fire, but that proved entertaining during the demo. During the tart workshop, the ladies used salad bowls and knives to mix the tart dough by hand. We wrapped and froze the dough, and then rolled, filled and baked them. I had a great team of helpers buzzing about to assist. The women enjoyed my stories and we sold out copies of the books. Two women showed up with their copies of The Kosher Baker for me to sign, telling me their favorite recipes. I felt so privileged to bring the joy of kosher baking across the world. Who knows where I’ll go next?? Photo at top: The Kowloon night market, called the Temple Street Night Market, is a busy Hong Kong street bazaar with goods and food sold every night.